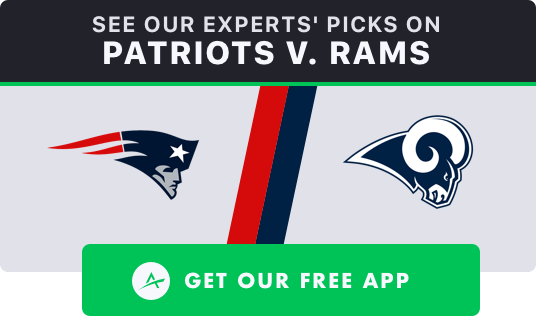 Here’s a breakdown of the Super Bowl 53 DFS slates featuring the Los Angeles Rams vs. New England Patriots on DraftKings and FanDuel. Contests lock on Sunday, Feb. 3 at 6:30 p.m. ET. Tom Brady. The ability of Aaron Donald to get interior pressure, as well as the Rams’ improved pass coverage due to the Aqib Talib effect, won’t make this easy on Brady, but if he struggles that will only lead to more pass attempts for the Super Bowl MVP frontrunner. In fact, Brady’s pass attempts in the past five Super Bowls are 48, 62, 50, 41, 48. Jared Goff. Capturing all of the Rams’ passing production via Goff rather than attempting to save salary by using Robert Woods or Brandin Cooks is especially important in this game. Why? Because the Patriots excel at shutting down the opponent’s top two receivers, which creates uncertainty as to how Goff’s targets will ultimately be distributed. Todd Gurley. He was out-snapped 36-32 by C.J. Anderson in the NFC title game, but whereas New Orleans is a team you can attack with wide receivers (their 15.2 receptions per game allowed to the position was second-most during the regular season), the Patriots are best attacked by running backs who can win against their weakest players in coverage, linebackers Kyle Van Noy, Dont’a Hightower, and Elandon Roberts. Opponents have targeted backs against the Pats on 27% of postseason attempts. At worst, Gurley should function as the Rams’ version of James White; at best, he’s the highest-scoring running back in fantasy. James White. Talib makes the Rams much harder to throw outside and downfield against, which tends to funnel targets underneath. In the postseason, backs have been targeted against LA at a 29% clip, and, like the Patriots, the Rams are most exploitable at linebacker (I discuss this more in depth in our Super Bowl 53 betting guide). Sony Michel. He’s averaging 19.5 carries for 90.0 yards and 0.88 touchdowns on the ground in eight games since the bye and still got 16.5 carries per game in the two losses over that span. To get Brady in the Captain spot and still make this work, you would have to punt the last spot with James Develin, so I prefer to instead use White in the Captain spot and go with Gerald Everett in the last remaining slot. Everett has run 42 routes to Tyler Higbee‘s 23 this postseason, according to Pro Football Focus. Quarterbacks score more relative to backs and receivers in half-point PPR, so Tom Brady and Jared Goff should be locked in. The next spot comes down to Todd Gurley vs. Sony Michel vs. James White. Michel costs $500 more than Gurley, and though White costs $1,500 less than Gurley, most of White’s production can be captured through Brady, leaving Gurley as the best option. Everett is the cheapest viable player at $6,000, which would leave up to $9,000 for the final spot. Josh Reynolds ($8,500), Phillip Dorsett ($8,500), and Chris Hogan ($7,500) are each an option, but Rob Gronkowski ($9,000) has the best matchup, in addition to seemingly the most upside from a volume perspective (11 targets, 24% target share in the AFC Championship game). Correlation coefficients via our NFL Correlations Dashboard. Since New England’s Week 11 bye, James White and Sony Michel have a 0.56 correlation. Tom Brady and the opponent’s QB have a 0.58 correlation. In games with an over/under of 50 or more, that increases to 0.73. Since Kupp went down for good, Jared Goff has had ridiculously strong correlations with his TE1 (0.93), WR1 (0.89), and WR2 (0.87). Goff has a 0.86 correlation with the opponent’s QB since Kupp went on IR. Brandin Cooks and Robert Woods have a 0.95 correlation since Kupp went on IR. The Patriots defense and the opponent’s skill-position players all have negative correlations except for RB2 (0.05), but TE (-0.10) and RB1 (-0.22) are a lot weaker than WR2 (-0.42) and WR2 (-0.32). Pictured: Los Angeles Rams quarterback Jared Goff (16) and tight end Gerald Everett (81). Photo Credit: Matt Kartozian-USA TODAY Sports. Even though Sony Michel falls in Tier 3 as he faces a Rams run defense that has stifled the Cowboys (22 carries, 50 yards) and Saints (21 carries, 48 yards) in the postseason, he’s still one of the top choices for this slot based on his relatively low cost ($10,200) and high upside should New England go on to win; he’s averaging 20.5 carries, 100.7 rushing yards, and 1.17 touchdowns in six wins since the bye. Given New England’s upside-capping secondary play of late, Julian Edelman has to be considered the top receiver in Tier 2. Edelman has been a lock over his past 10 games, and since Josh Gordon (suspension) last played in Week 16, Edelman’s average of 9.9 targets per game far surpasses the averages of Woods (8.0) and Cooks (7.4) since Kupp’s injury. Also working in Edelman’s favor is that the Rams tend to play more zone coverage than the Patriots, making Edelman more likely than Woods or Cooks to get chances against linebackers in coverage. Tom Brady-James White-Todd Gurley/C.J. Anderson: If the Patriots end up in more negative game script. Sony Michel–Todd Gurley/Jared Goff: If the Rams end up in more negative game script. I also wouldn’t shy away from pairing James White and Sony Michel or Todd Gurley and C.J. Anderson, as the running back position should be heavily involved in both teams’ offensive game plans. Through two postseason games, C.J. Anderson leads Gurley in carries inside the 10 (8-1) and overall (39-20). Not only does he have the potential to vulture a touchdown with no correlation to any other Rams skill player owned, but he also would benefit in the event of positive game script, which also gives you some nice leverage on Michel’s ownership. There’s a chance Josh Reynolds gets less playing time than usual in favor of heavier formations, but he’s still a solid leverage play. The Patriots allowed 2.9 fewer receptions and 45.0 fewer yards per game to each member of the last three elite receiving duos they faced (Adam Thielen and Stefon Diggs; Antonio Brown and Juju Smith-Schuster; and Tyreek Hill and Travis Kelce), so there could be production up for grabs. Even if Reynolds sits some snaps out, he’s still more likely than not to be used (and get single coverage) in high-leverage situations, such as in the red zone and on deep shots. The sharp money is on the under in this game, which is a positive for Rams kicker (and potential MVP?) Greg Zuerlein and Patriots kicker Stephen Gostkowski (as well as Rams D/ST and Patriots D/ST on DraftKings). Although Tyler Higbee has run fewer routes than Everett this postseason, his usage has still been on the rise with the Rams using more double tight end personnel. Higbee has one of the four Rams targets inside the 10 this postseason, and with teammates like Gurley, Woods, and Cooks, he also benefits from being a low priority for the opposing defense. In the AFC title game, at least eight routes were run by Rex Burkhead (17), James Develin (14), Cordarrelle Patterson (11), and Dwayne Allen (8), per PFF. Among players we can reasonably expect to see offensive snaps, Burkhead and Develin are the best bet to be the two lowest-owned running backs, Patterson the lowest-owned wide receiver, and Allen the lowest-owned tight end. 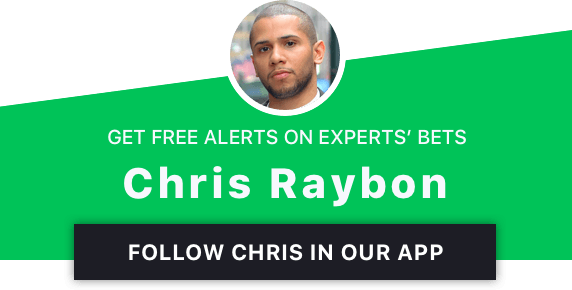 Chris Raybon is a Senior Editor at the Action Network and a co-host of “I’ll Take That Bet” on ESPN+. He has watched every snap of every NFL game since 2010 — even the kneel downs. Follow him on Twitter @ChrisRaybon and read about how he quit his accounting job and got paid to watch sports.